Hummer is an high-class creation from General Motors and is known worldwide for its bizarre performance. It was first produced for the US Army. The manufacture of Hummer started in the early 1990s, but General Motors wrapped up production from June, 2009, after its failure to sell the iconic brand to a Chinese firm. Shaakha & Co has joined hands with Hummer International Automotive which holds the stocks of Hummer make of trucks sold by General Motors. Under the agreement extended among the two parties, Saakha will import Hummer in Nepal, which is only offered in a small stock. GM has stopped the manufacture of the Hummer. “Hummer is no longer in production. The cars that come here are from the stock remaining with the manufacturer,” said Prabal Saakha, the managing director of Saakha & Universal Automobile Pvt Ltd. Saakha is positive of getting at least 10 units of Hummer before the stock diminishes. The company on Thursday handed key to the first owner of Hummer in Nepal during a function. By April 2010, several sale of the brand became unlikely as inventory exhausted and showrooms began shutting down. After filling a rental car fleet order, the last Hummer H3 revolved off line at Shreveport on 24 May 2010. Hummer H3, the smallest model from the Hummer stable, has 3.7 liter petrol engine with the power of 180 kw and torque of 328Nm. The SUV is available with the choice of 5-speed manual transmission or 4-speed automatic transmission. The other special features of Hummer H3 are single wheel, full speed traction control; cruise control; four channel anti-lock braking system; fog lamps; dual halogen headlamps with auto lamp control; three power outlets; and leather seating surfaces. Hummer has also taken extreme care for the safety of their consumers with safety features like dual front airbags with passenger sensing system, roof rail airbags with roll over sensor, child safety seat lower anchors and tethers for children, keyless entry with remote panic button, theft-lock and battery rundown protection, among others. If fresh manufacturing of Hummer begins again, we´ll try our level best to get the dealership of the brand for which we´ll have to prove that we can sell it properly,”-Saakha. The company has already sold a Hummer H3, while two more units are on their way to Kathmandu. If anyone searches for sophistication in Hummer, they´re looking for a wrong vehicle. Hummer has specialized in performance and everyone says that Hummer goes as far as your guts. 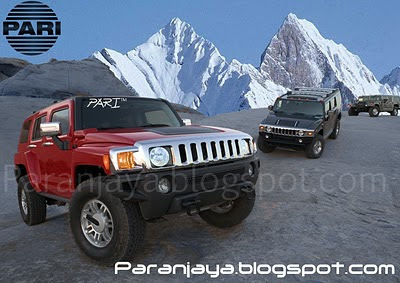 Hummer has very limited market in Nepal as it is one of the high choice vehicles that are available here. It is neither an economic vehicle, nor a perfect ride for the populated roads of Kathmandu. Parking spaces can be a real problematic to Hummer owners. Due to the heavyweight that Hummer has, the emergency braking is not very effective like in other vehicles. This vehicle is for the passionate users who are ready to buy it at the cost of anything. It´s an identity which has an iconic value. The price of this vehicle will depend upon the equipment used by the owners. Nice... I have yet to see Hummer rolling along in Kathmandu though.